The salad dressings posted earlier this week are all great, but this is the one you really want to master. There are few salads that need more than a basic vinaigrette: a simple emulsion of oil and vinegar with seasonings. More than any other dressing, this is what I turn to for our salads on a weekly basis. It's simple, versatile, inexpensive and delicious. Let's take a closer look. 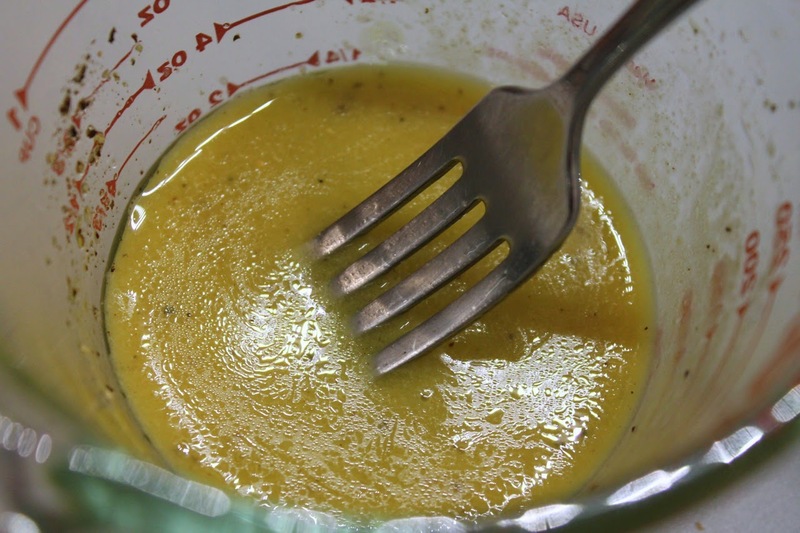 I said that vinaigrette as an "emulsion," a mixture of two liquids that don't easily blend. In fact, even after mixed, the two ingredients will not be fully integrated in the way that liquid ingredients mix together in cocktails. Rather, the whipping motion causes the droplets of the two liquids to be held in suspension. The drops are so small, that they appear to be mixed together. It's not a permanent state though. Especially with simple vinaigrettes, you'll see the ingredients separate out fairly quickly, which is why it's important to dress the salad immediately after mixing up the vinaigrette. The presence of other ingredients helps hold the mixture longer--mustard, for example, or if you want to get tricky a small pinch of soy lecithin could be used. 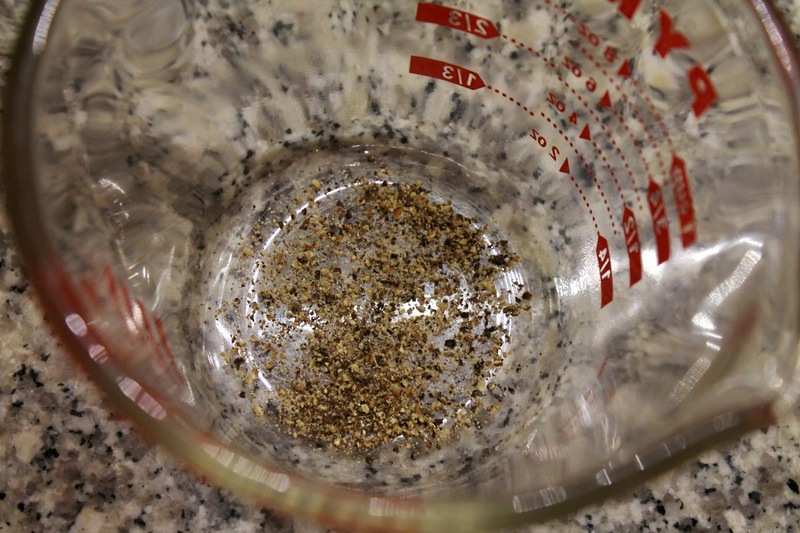 1) Combine the seasonings in mixing bowl (I use a 1- or 2-cup Pyrex glass measuring cup, which makes the dressing easy to pour when you're done). Here, I'm just using salt and freshly ground black pepper. 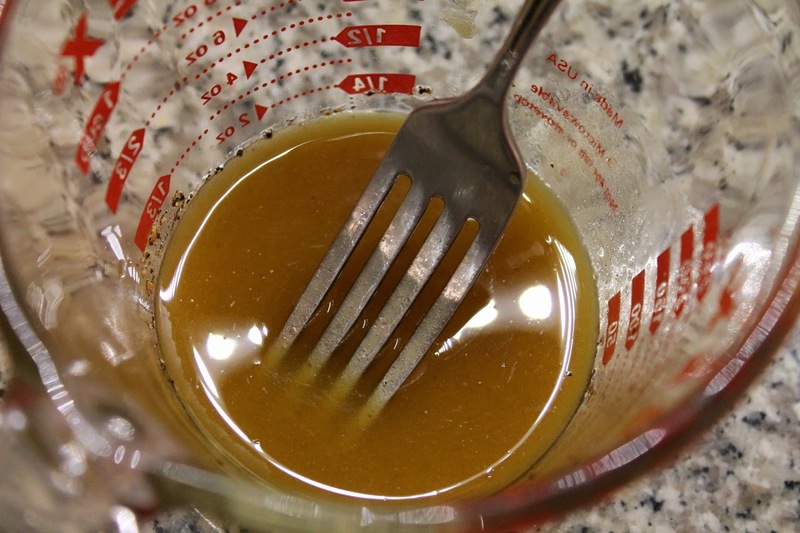 2) Add vinegar and any other ingredients except for the oil and combine with a fork. 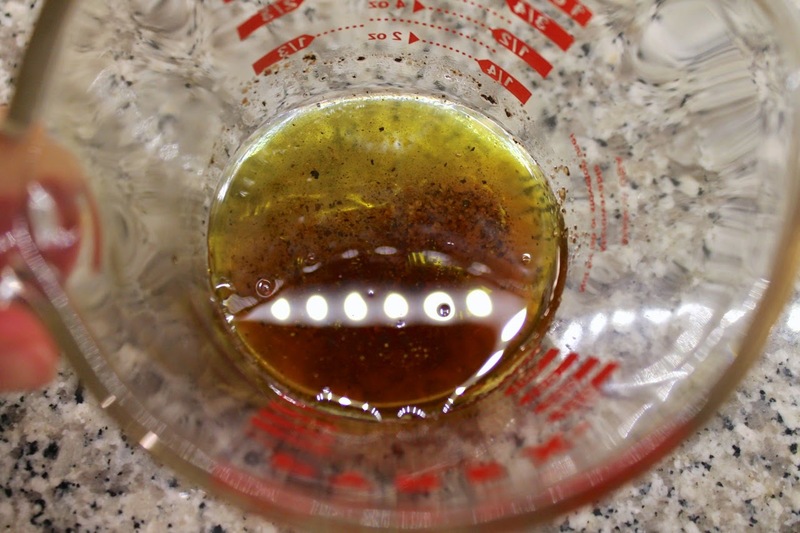 Because the non-oil ingredients will mix together well, it's a good idea to mix them first. Salt, for example, will dissolve in vinegar, but it won't dissolve in oil. Almost any type of flavored vinegar will work well, especially red or white wine vinegar, regular or white balsamic vinegar and apple cider vinegar. Alternatively, you can also use citrus juices, especially lemon or lime, or a mixture of vinegar and citrus. Here, I'm only using red wine vinegar. Other common ingredients that could go in at this step include Dijon or other types of mustard, finely minced garlic or shallots, fresh or dried herbs and sweeteners like honey, maple syrup or a pinch of sugar. 3) Add the oil. You'll see that it sits on top of the other ingredients rather than immediately mixing into them like other liquids. I almost always use extra-virgin olive oil in vinaigrettes. 4) Vigorously whisk the ingredients together until they form an emulsion. This is the most important step and it's pretty cool when it's done right. As you whisk, the ingredients will mix together, but at the moment they form the emulsion, the change in the mixture is obvious. It's becomes cloudy and thicker. It's even a different color. 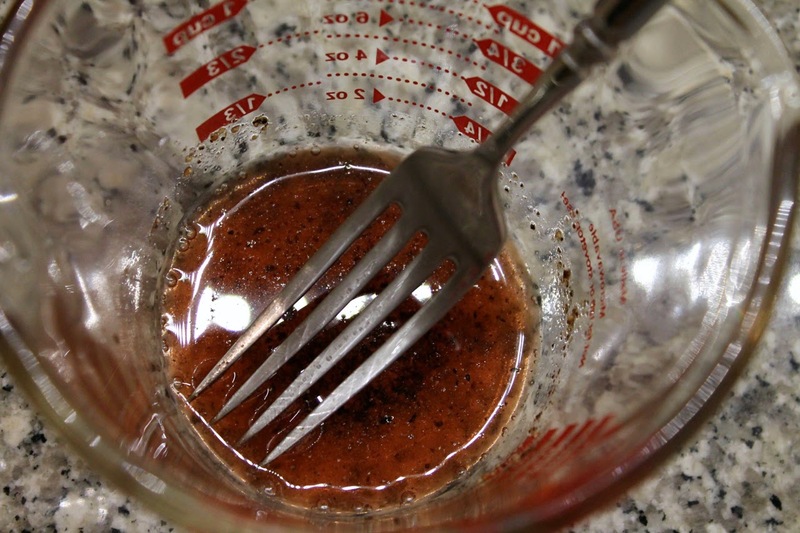 Red wine vinaigrette, which before looked dark red, suddenly becomes a dark golden color. Be sure to whisk until you reach this point. I generally find that 70 beatings with a fork is a good point to aim for. And you're done. 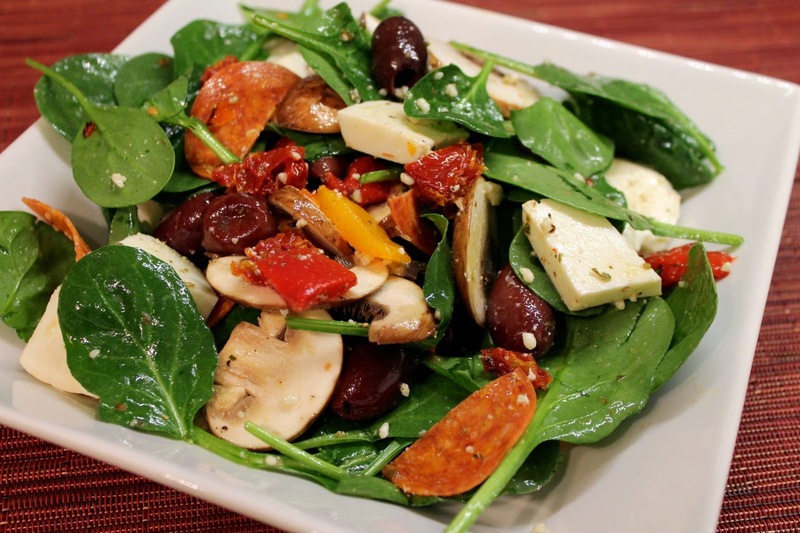 The Pizza Salad recipe below uses the basic red wine vinaigrette made above. The Chicken and Roasted Asparagus Salad's dressing is identical except that I used white balsamic vinegar. 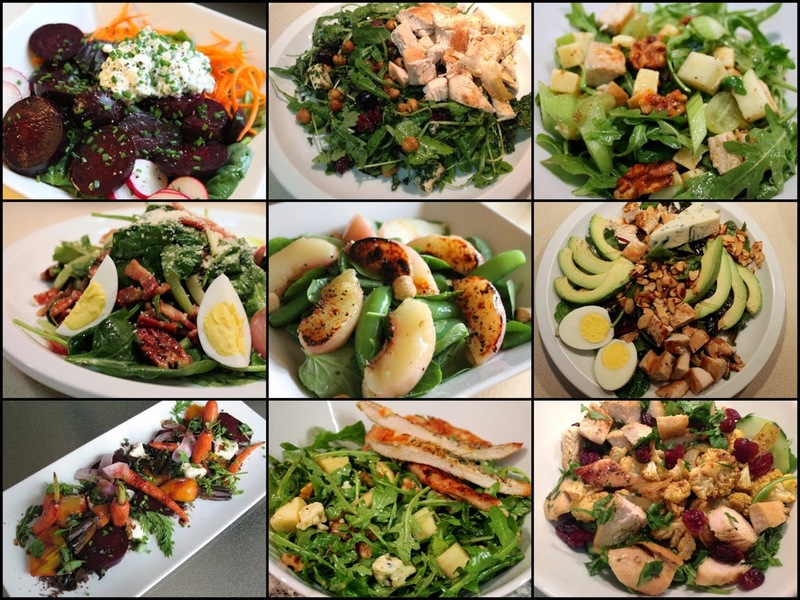 At the bottom, there are link to other salads that use a basic vinaigrette. 1 tbsp. flavored vinegar, such as red wine, white wine, balsamic, apple cider, etc. Combine vinegar, salt and pepper in a small bowl. Add olive oil and whisk briskly until emulsified. Serve immediately with salad. Combine all ingredients in a large salad bowl. Pour vinaigrette over ingredients and toss to coat. 1. Preheat oven broiler. Line asparagus up in an even layer on a baking sheet. Spray with olive oil and season with salt and pepper. Broil until lightly browned, about 7 to 8 minutes, turning over at the halfway point. Remove from oven, cool, and cut into 1-inch pieces. 2. Heat 2 tbsp. olive oil in a medium frying pan. Pat chicken cutlets dry and add to hot oil. Season with salt and pepper. Cook for about 5 minutes until lightly browned, turn and cook another 5 minutes until lightly browned on the other side and cooked through. Allow to cool then chop into 1-inch pieces. 3. 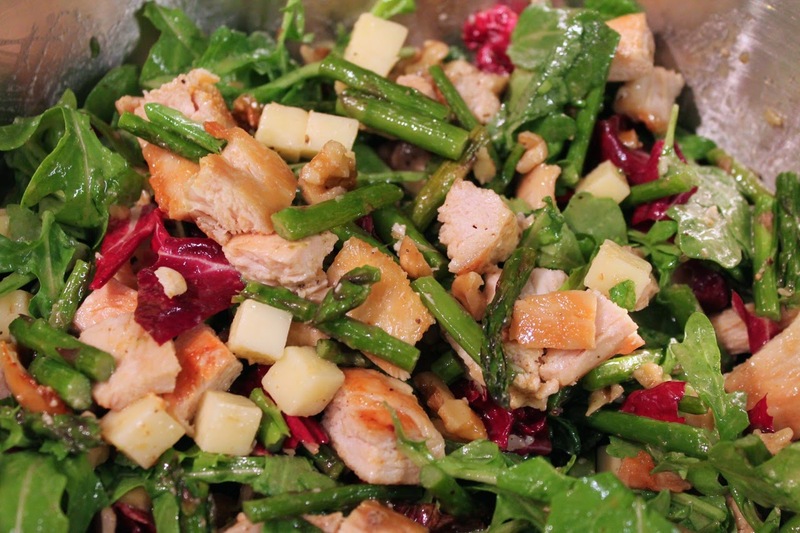 Combine salad leaves, cheese, walnuts, asparagus and chicken in a large bowl. Drizzle with dressing and toss to coat. Cobb Salad with red wine vinegar (i.e. the basic dressing above). Reconstructed Hummus Salad with lemon juice and garlic. Crispy Kale and Roasted Chickpea Salad with apple cider vinegar, Dijon mustard and honey. Smoky Waldorf Salad with apple cider vinegar, Dijon mustard, walnut oil and smoked olive oil. 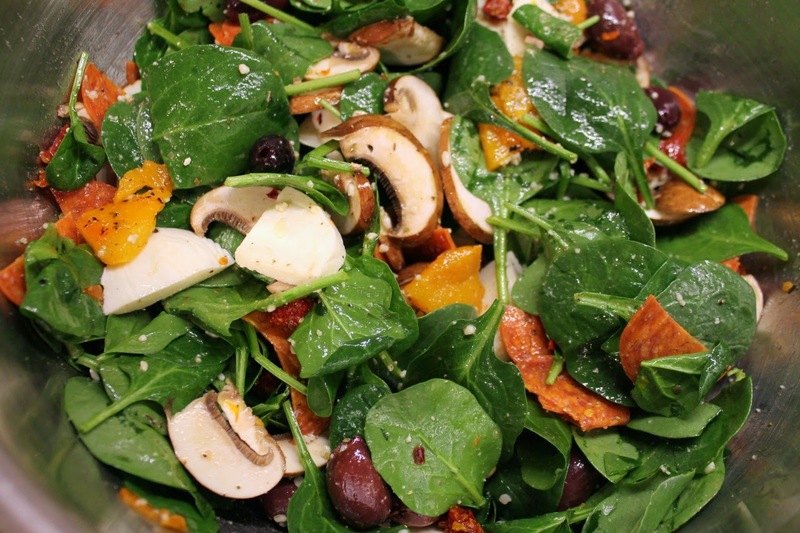 Wilted Spinach and Bacon Salad with red wine vinegar, lemon juice and Dijon mustard. Broiled Peach Salad with Watercress, Sugar Snap Peas and Toasted Hazelnuts with white wine vinegar and honey. Roasted Beet and Cottage Cheese Salad with white wine vinegar, lemon juice and honey. Agave-Mezcal Chicken and Curry Roasted Cauliflower Salad with lemon juice and fresh basil. Roasted Beet and Carrot Salad with balsamic vinegar and honey. Smoky Winter Salad with white balsamic vinegar, maple syrup and smoked paprika. Pizza salad is inspired, except it makes me want to drink a beer, which probably defeats the purpose of eating a salad.